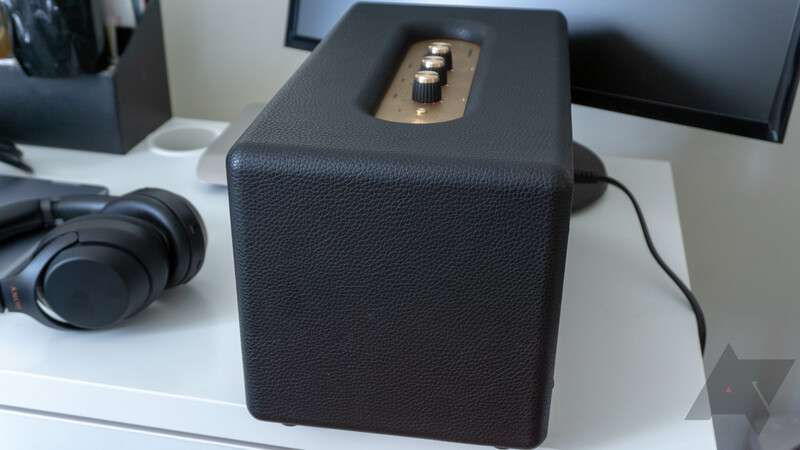 The Stanmore II is a good speaker—far better than most Assistant speakers. However, the Home Max is still the king of this product category by a comfortable margin, and it's the same price. The Alexa version of the Stanmore II speaker is on Amazon for $50 less, and it has the same competent sound quality. If you're not married to Google, that one is a better purchase. 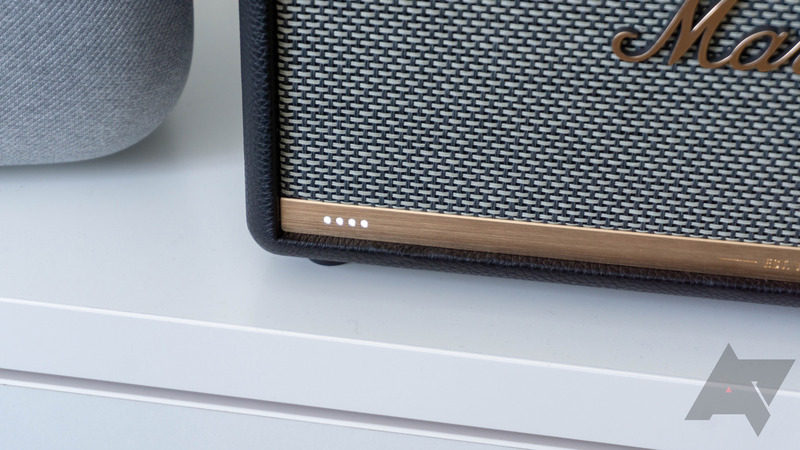 Audio Powerful, crisp sound with above average bass for a smart speaker. Manual adjustments with knobs. Design Looks like a Marshall amp, and the adjustment knobs on the top are fantastic. Input Supports WiFi, Bluetooth, aux, and RCA. Audio again The audio is good, but not as good as the Home Max. Design again The back of the speaker is pretty ugly. Price $400 is a lot to pay for a smart speaker, no matter how good it looks. The Home Max is also the same price. Even if the branding wasn't so prominent, you'd instantly recognize the Stanmore II as a Marshall speaker. It has the classic blocky shape, gold accents, and of course those knobs! 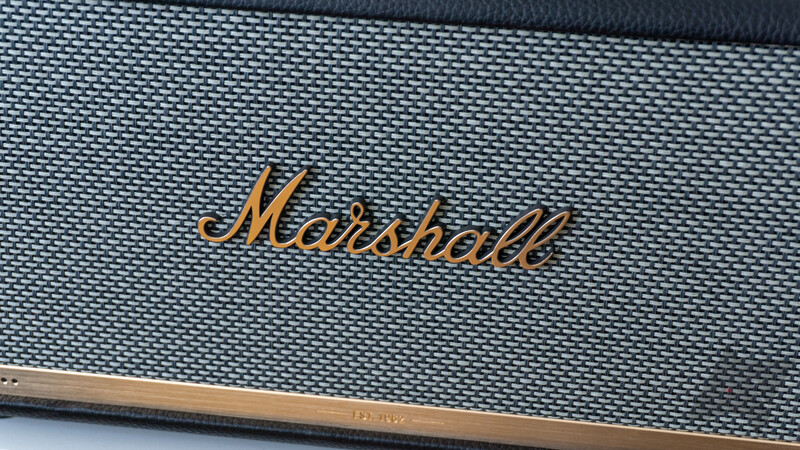 The housing is a black faux leather material, and the front has a cloth-covered grille with the Marshall name spelled out across it. The overall fit and finish of the Stanmore II is excellent, except when you get to the back. Here, it's like the designers just gave up. It doesn't have the same texture as the rest of the speaker and is covered with warning labels. I know, it's the back of a speaker, but it's a very expensive speaker. I'm willing to forgive the back because I love the top of this device. The control panel includes a button to switch between WiFi, Bluetooth, Aux, and RCA input. There's also a mute button, play/pause, and the 3.5mm audio input. The centerpiece of this panel is obviously the trio of analog control knobs, which are smooth and fun to spin. On the far left is volume, then bass, and treble on the right. Each knob has a glowing ring of red LEDs around it to show the current level, and they look great. The knobs spin endlessly, so you can change settings from your phone without leaving the knob out of sync. Note: there's an app, but it only works with the Alexa version. The Assistant Stanmore II only connects to the Home app. 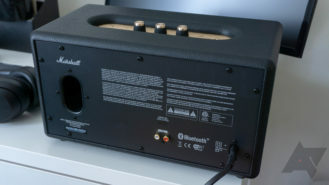 The only external hint that this speaker has Assistant inside is the array of four LEDs toward the bottom left on the front. They're a different take on the four LEDs adorning Google's Home devices, but they work the same. The LEDs flash when you call up Assistant with the "OK Google" phrase, and they strobe left to right when Assistant is thinking over your commands. It's great to see RCA support on an Assistant speaker, but I'm a bit miffed there's no cable included in the box. Same goes for the Aux cable; you have to buy one separately. All you get in the box is the speaker and a power cable. The Stanmore II has a 50 watt Class D amp for the woofer, along with two of 15 watt Class D amps for the tweeters. The audio this speaker pumps out is loud and crisp. It's plenty powerful to fill a medium-sized room to the point it will drown out human voices. If you share a wall with neighbors, they will hate the Stanmore II as much as you love it. 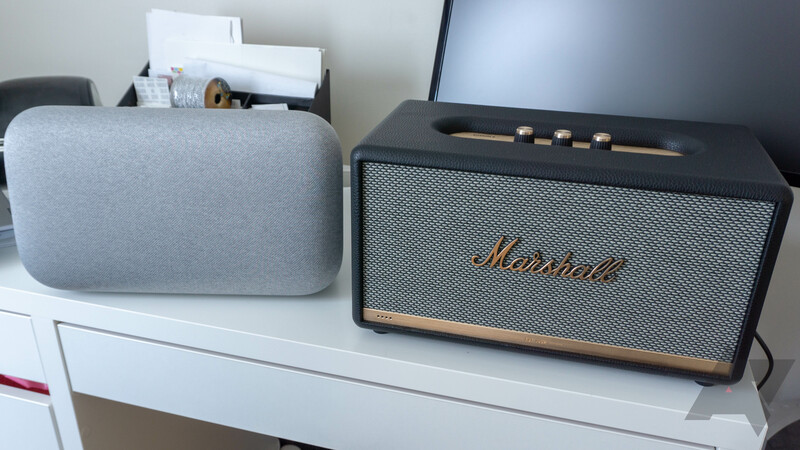 The bass performance is better than most smart speakers I've heard, but it does fall short of the Home Max, which has two woofers and Google's fancy automatic adjustment algorithms. The bass doesn't resonate in your chest like the Home Max, but it's still powerful enough to reproduce your tunes well. You can crank the volume quite high without significant ill effects. 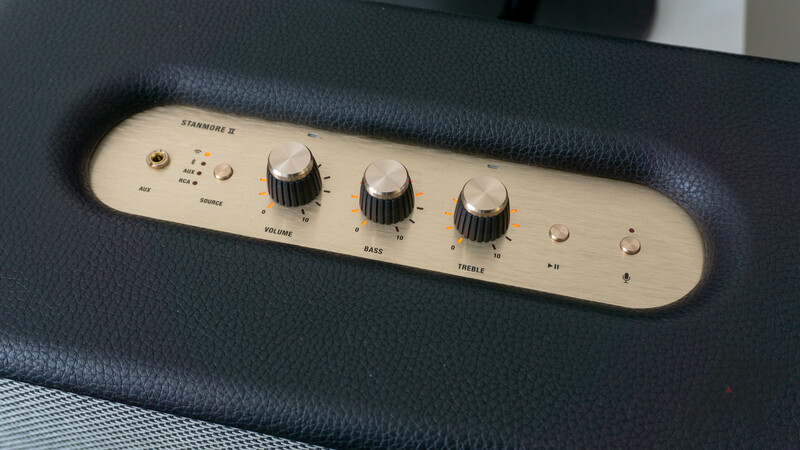 The Stanmore II does suffer from a tiny bit of distortion at high volume in bass-heavy tracks, but you can back off a little on the bass knob to eliminate that. Google, of course, put a lot of thought into the microphone setup for the Home Max. That speaker can hear you even if it's blasting at high volume. The Marshall Stanmore II isn't quite as good, but I was still happy with the sensitivity. You don't have to shout to be heard over the speaker when it's playing, but you might have to raise your voice slightly. When there's no music playing, the speaker is perfectly responsive at normal speaking volume from across a medium-sized room. Probably not. 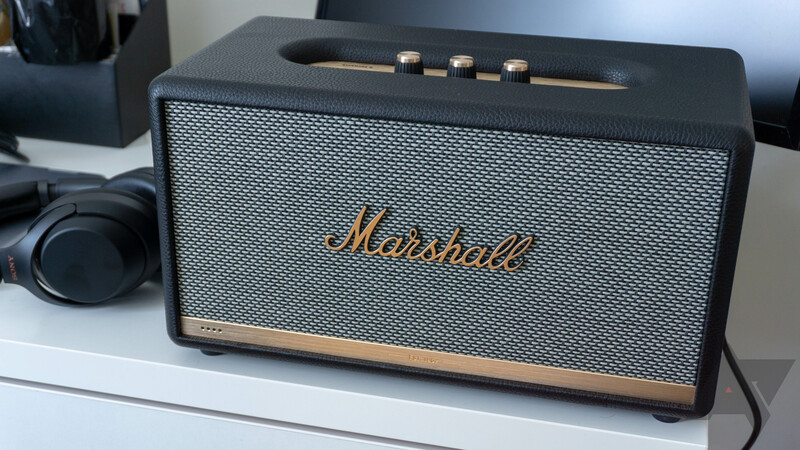 The Marshall Stanmore II is a good speaker—undeniably one of the best you can get with Assistant built-in right now. Music of all types sounds clear, the volume is impressive, and it has some power behind the bass. I also love the analog adjustment knobs on the top. It's a slick-looking piece of hardware, but it doesn't exactly blend in. 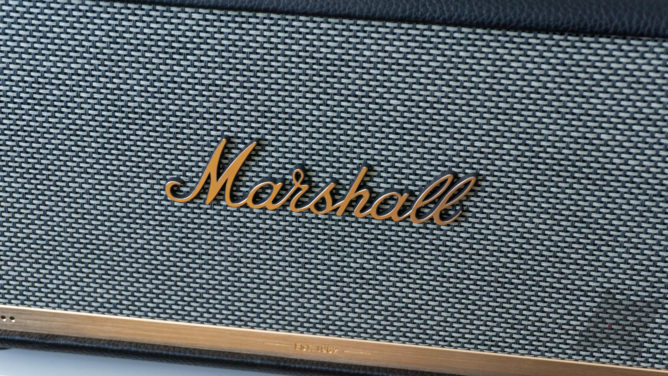 If you like the Marshall styling, you'll be fine having the Stanmore II out in the open. Just make sure the ugly back is against a wall. The biggest problem for the Stanmore II is the continued existence of the Home Max. Google sells this speaker for $400, just like the Assistant-powered Stanmore II. The Home Max sounds better (especially the bass), and I think the understated look will complement more home decors. Amazon won't sell the Assistant version of the Stanmore II (because Alexa) so it's only on the Marshall store right now. You should only get the Stanmore II over Google's speaker if you strongly prefer the aesthetic or need RCA input, but the Alexa version is $50 cheaper if you prefer Amazon's platform. That's a bit easier to justify, but I'd still spend the extra $50 on a Home Max.